1. Preheat the oven to 180°C, gas mark 4. Grease a small, 25 x 18cm roasting tin or similar-sized shallow baking tin and line with baking parchment. Weigh 300g of the courgettes (reserving the remainder for decoration) and grate onto several sheets of kitchen paper. Cover with several more sheets of paper and press out as much moisture as possible. 2. Place the butter, sugar, vanilla, eggs, flour and cocoa powder in a bowl and beat with a handheld electric whisk until smooth. Whisk in the courgette until evenly combined. Turn into the tin and level the surface. Bake for 40 minutes or until risen and just firm to the touch. Leave to cool in the tin. 3. Place the milk chocolate in a bowl and melt over a pan of gently simmering water, or in short spurts at medium power in the microwave. Stir frequently. Once melted, dot the butter into the chocolate and stir until melted. 4. Lift the cake out of the tin and slice off the top if risen in the centre. Invert onto a flat board or plate. Spread the melted chocolate over the top of the cake so it runs down the sides. Leave to set. 5. Melt the plain chocolate as above and spoon into a disposable piping bag. 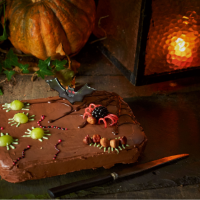 Snip off the merest tip and pipe a spider’s web on one corner of the cake. 6. For the spider, push the blackberry and a hazelnut into the chocolate over the web. Cut short lengths of strawberry lace and position for legs. Cut a thin slice of reserved courgette and cut out small circles for eyes. Secure with writing icing. For insects, halve more hazelnuts and arrange in a curved line on the cake. Position a cluster of halved grapes on the chocolate. Slice off thin strips of courgette skin and cut out bat shapes using a small cutter. Use the writing icing to pipe eyes, legs and additional creatures on the cake.